Sometimes we find the situation when we have to make a railway reservation but we do not have the enough time to go to the railway counter nor we have access to laptop or PC. So in this situation we are unable to book the ticket. Overcoming for these circumstances or we can say updating themselves with current market demand, Now IRCTC had developed a mobile application that will be really helpful for booking the ticket. This also provide the facility for checking the PNR status, viewing the available trains, checking the ticket availability and other information that we can usually use at the IRCTC website. 1. 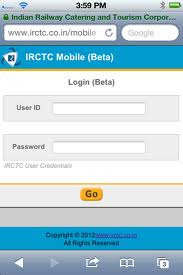 Open the https://www.irctc.co.in/mobile through the mobile browser and login using the existing login credentials. 2. Select the details like - From,To,journey dates, class, quota and ticket types. 3. Choose the train according to availability. 4. Add the passengers or use the existing lists of passengers. 5. Confirm the booking details and pay through your Credit or debit card. 6. Now your booking is succesful, you will get the ticket on your email. For more details visit the IRCTC Website.